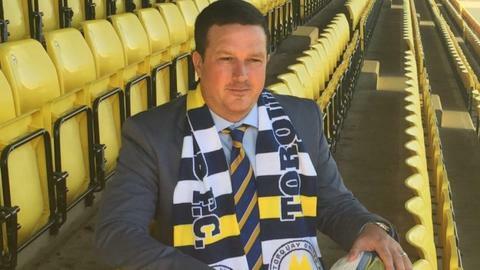 Torquay United manager Paul Cox says the club must get used to not being the 'big boys' in the National League. The club were relegated from League Two in April 2014 and have struggled with a much-reduced budget since. "One of my biggest battles this season will be to overcome the stigma that's still attached to us," he said. "There's still a lot of people out there with, I think, delusions of grandeur that haven't acclimatised to the fact of where we are yet." The Gulls are currently 18th in the National League, having finished 13th in the Conference last season. Torquay were taken over by a consortium of local businesspeople in the summer after millionaire owner Thea Bristow left. 2004: Promoted to League One 2010: Paul Bristow dies. Wife Thea takes his place on the board. Since then the club has been forced to operate on a reduced budget, closing its youth academy, leasing part of the training ground to Plymouth Argyle's youth team and still facing legal claims which director of football Dean Edwards has said "could finish the football club". "We're not the big boys any more," Cox told BBC Sport ahead of Torquay's first-ever league match against newly-promoted Bromley. "We just can't think that we're Torquay United and people are going to roll over and give us three points, we're going to have to work extremely hard with the situation we're in at the minute. "With the profile we've had in the past, teams will want to come to Plainmoor because they'll look at the pitch, they'll look at the stadium and they'll want to play here and they'll see us as a big scalp. "If we keep continuously telling everybody that we're the 'bigger' club, the future won't look so healthy. "Ask the people at Hereford United, ask the people at Stockport County, the people that sit there and believe that they have a given right to bat clubs, it always ends in tears."